Organizers of a rally a few hours before Saturday’s presidential candidate forum in Storm Lake say shrinking market options for farmers must be addressed. Many of the Democratic candidates who’ve been traveling through Iowa this year already have focused on consolidation and mergers in the agricultural sector. During a recent Radio Iowa interview, New Jersey Senator Cory Booker said mega-mergers are creating real problems for family farmers. Last August Booker proposed a moratorium on all corporate mergers. He argues federal anti-trust laws designed to prevent monopolies aren’t being followed. Booker said the result is stagnant wages while corporate profits are at an 80 year high. Vermont Senator Bernie Sanders made a campaign swing through Iowa earlier this month and denounced concentration in the meatpacking industry as well as the Bayer-Monsanto merger. 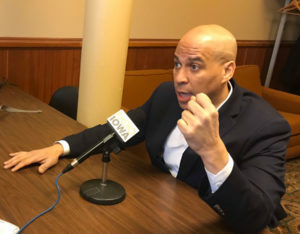 Neither Sanders nor Booker will be in Storm Lake for Saturday’s candidate forum, but two other U.S. senators who’re running for president will be. Senator Amy Klobuchar has been telling Iowa audiences she’s been able to bridge the rural-urban divide in Minnesota. Massachusetts Senator Elizabeth Warren has been calling for the break-up of monopolies and this week pledged to appoint federal officials who would reverse “anti-competitive mergers” — like the Bayer-Monsanto merger. Aaron Lehman is president of the Iowa Farmers Union, one of the sponsors of the “Heartland Forum” Saturday afternoon at Buena Vista University. “Farmers really are wanting to hear how the discussion around farm issues can really make a difference in their communities and on their farm,” Lehman told Radio Iowa this week. J.D. Scholten, the Democrat who challenged Congressman Steve King in last fall’s election, has been helping publicize the Saturday morning rally in the Storm Lake High School gym. Scholten will speak about market consolidation at the event. The “Farmer’s Bill of Rights” rally starts at 10:30 tomorrow. The Heartland Forum begins at 1:30 and will feature candidates Warren and Klobuchar as well as former San Antonio Mayor Julian Castro and former Maryland Congressman John Delaney. Ohio Congressman Tim Ryan has said he’s considering a run for the White House and he’ll attend the forum, too.